When it’s finished, the CPV St. Charles M&R Station and Pipeline in Waldorf, Maryland, will be one of the cleanest natural gas facilities ever built in Maryland and the Greater DC Metro area. The new 725 megawatt natural-gas fired combined cycle power plant will help reduce the dependency on older coal-burning power plants which currently supply a majority of the region’s power. Competitive Power Ventures chose Ferguson Trenching Co. Inc. (FTC) of ? to design and build the necessary natural gas infrastructure to supply the plant—the largest design-build contract in FTC’s 50-year history. The contract was one of only four off-site contracts that were awarded to open shop contractors. Known as CPV St. Charles, the new facility will generate enough electricity to power more than 650,000 homes and use state-of-the-art technology to produce electricity efficiently and cleanly to help meet the region’s demand for energy. FTC overcame numerous challenges to build CPV St. Charles. The contractor had 15 months to design, permit, construct and test a complete gas meter and regulator station and over a mile of 16” steel interconnecting pipeline. FTC began construction in January 2015, smack dab in the middle of winter and at the mercy of Mother Nature. Occasional snowfall set FTC back a few days, but it was the constant rain that slowed construction down. Access to the pipeline easement was limited and getting material and equipment in and out became a challenge. Rubber tire vehicles had to be towed into and out of the easement, making cleanup on the back end of the day time consuming. What precipitation Mother Nature didn’t drop from the sky, was hidden just below the ground surface. The owner had not done any soil borings off site during their land evaluation, so FTC went into construction a little blind. Initial soil tests were daunting: Two feet below the surface was the groundwater table. Most of the facility infrastructure had depths of 7 to 14 feet deep. In order to complete construction, significant dewatering was required. 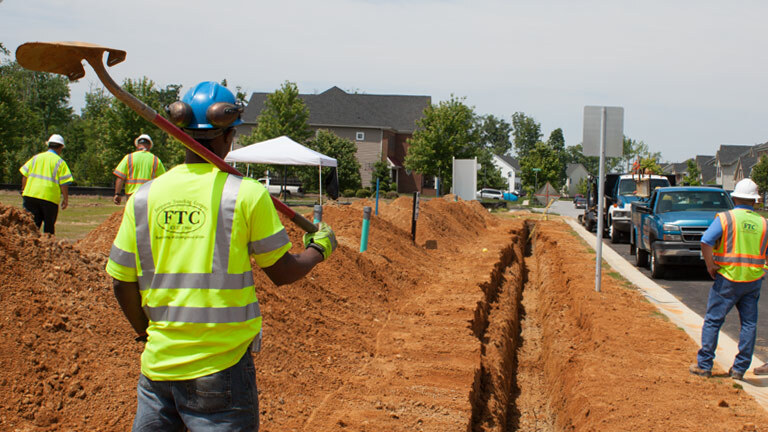 In addition to sump pits at regular intervals, FTC designed a complete well point dewatering system to lower the water table to 14 feet below the surface. More than 50 percent of the estimated 6,000 feet of trench had to be dewatered. In addition to water issues, FTC faced significant manufacturing times for specialized equipment at the meter and regulator station. The regulator valves, forced draft line heater and filter/separator all had delivery dates in excess of 26 weeks. It was imperative these productions were met in order to keep the overall project on schedule. FTC’s entire construction team tackled these challenges with ingenuity and hard work to make this project a complete success.